In car handling, slip angle is the angle between a rolling wheel’s actual direction of travel and the direction towards which it is pointing (i.e., the angle of the vector sum of wheel translational velocity v and sideslip velocity u). This slip angle results in a force perpendicular to the wheel’s direction of travel — the cornering force. This cornering force increases approximately linearly for the first few degrees of slip angle, then increases non-linearly to a maximum before beginning to decrease. This is directly analogous to the Coefficient of lift in Aerodynamics. A non-zero slip angle arises because of deformation in the tire carcass and tread. As the tire rotates, the friction between the contact patch and the road result in individual tread ‘elements’ (infinitely small sections of tread) remaining stationary with respect to the road. 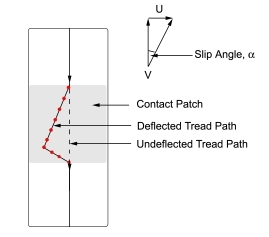 If a side-slip velocity u is introduced, the contact patch will be deformed. As a tread element enters the contact patch the friction between road and tire means that the tread element remains stationary, yet the tire continues to move laterally. This means that the tread element will be ‘deflected’ sideways. In reality it is the tire/wheel that is being deflected away from the stationary tread element, but convention is for the co-ordinate system to be fixed around the wheel mid-plane. This deflection gives rise to the slip angle, and to the cornering force. Because the forces exerted on the wheels by the weight of the vehicle are not distributed equally, the slip angles of each tire will be different. The ratios between the slip angles will determine the vehicle’s behavior in a given turn. If the ratio of front to rear slip angles is greater than 1:1, the vehicle will tend to understeer, while a ratio of less than 1:1 will produce oversteer. Actual instantaneous slip angles depend on many factors, including the condition of the road surface, but a vehicle’s suspension can be designed to promote specific dynamic characteristics. A principal means of adjusting developed slip angles is to alter the relative roll couple (the rate at which weight transfers from the inside to the outside wheel in a turn) front to rear by varying the relative amount of front and rear lateral load transfer. This can be achieved by modifying the height of the roll centers, or by adjusting roll stiffness, either through suspension changes or the addition of an anti-roll bar.